A) What is the Environmental Impact Declaration (D.I.A.) ? B) What is the 'DIA' for the El Prat airport expansion? C) What are the City Hall of Gavà's allegations ? D) What are the City Hall of Castelldefels' allegations ? The Ministerio de Fomento as promoter for the Barcelona airport expansion (a public work) had to present an Environmental Impact Report (EIA), uonce it was presented and once the time period to present allegations by neighbors, city halls, or anyone who felt affected had expired, the Ministerio de Fomento had to answer all the allegations and later send the EIA with corrections to the Ministry of the Environment so that they could evaluate it. Then, the Ministry of the Environment can solicit the undertaking of new studies and when they have all the necessary information they publish the Environmental Impact Declaration (DIA) in the official Gazette approving or rejecting it and imposing conditions for its construction. 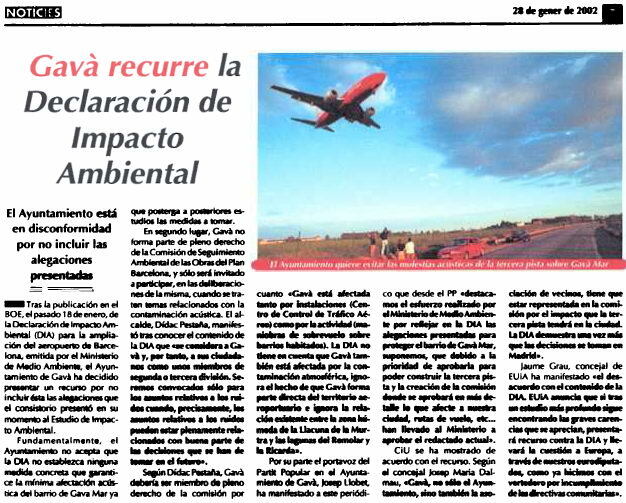 The Environmental Impact Declaration ('DIA') is a traditional reason for concern and friction between the 'Ministerio de Fomento' and the Ministry of the Environment, even among different departments within the Ministry of the Environment because the DIA has turned from a simple stamp into an essential procedure when dealing with public works such as the Barcelona airport expansion. According to data from March 2006, from the moment the government approves a project until the Ministry of the Environment gives the ok, 944 days go by (more than 2.5 years) on average. This is mainly due to the large number of study projects that the Ministry of the Environment has pending. On average, the processing of a freeway takes 1,119 days, 1,175 days for a high-speed train (AVE), 1,302 days for a dam, and an airport takes almost a year. B) WHAT IS THE 'DIA' FOR THE EL PRAT AIRPORT EXPANSION ? - Speaking of the EAST configuration, it is commented that the most affected zone of Gavà Mar would be the area closest to the airport, which has been "recently developed". This is completely incorrect; the part of Gavà Mar that is the closest to the airport was developed in the 1960's, as one can check in the HISTORY OF GAVÀ MAR section of this same website (Spanish version). - When the Environmental Impact Report ('EIA') is referred to, it is said that this study describes the affected people as 'newly' affected. The City Hall of Castelldefels makes an erroneous interpretation of this adjective by assuming that it refers to new inhabitants of Gavà Mar. What the 'EIA' is trying to say is that they are neighbors that had never been affected by the airport disturbances before but now they will be, that is why they are called "newly" affected. - The City Hall of Castelldefels defends the EAST configuration as preferential taking for granted that landings would be performed on the third runway flying over Gavà Mar, and not on the main runway (like they had always been doing since the construction of the main runway). The CSAAB could also opt for the EAST configuration as preferential but with landings on the main runway. With this, Castelldefels Beach would go from supporting the noise of landings 15% of the time to 85% of the time. o What would happen when the wind changes direction and the WEST configuration would have to be applied? Where would the heavy airplanes take off from since the third runway is short? o What would happen when AENA operates the airport in an INDEPENDENT manner with the EAST configuration as preferential? This would imply that simultaneous landings on the two runways would fly over Gavà Mar but also a large part of Castelldefels Beach 85% of the time.